In 2011, California reported that only 31% of 5th-9th grade students were physically fit. This represents a DECLINE of 3% from the prior year (CA. Dept. Education, Nov. 2011). So, how is "fitness" defined? Too often the muscled-up body-builder is regarded as the epitome of fitness. But can this person run a 5-K in under 25 minutes? What would his finish time be in an average triathlon? Can he bend at the waist and place his palms flat on the floor? Some football players can bench-press enormous amounts of weight. But a pole vaulter or gymnast might be able to do 3 times as many pull-ups as the football player. So, who is stronger? VO2max is an assessment of aerobic fitness. The NFL uses a bench-press test to assess muscular strength. The military has its own set of fitness standards. So there are many ways to define fitness. The body-builder may not be all that "healthy" either. For example, what is his/her resting heart rate and blood pressure? In fact, there is evidence that weight-lifting can actually have detrimental effects on the cardiovascular system (DeVan AE, et al. 2005). And body fat percentages less than 7-8%, which some body-builders strive for, are also unhealthy. So, don't judge an "athlete" by how he or she looks. Although someone might look healthy, their physique doesn't tell the whole story. In addition to those 5, I propose that "balance" also be included in assessing a person's fitness. Balance becomes much more important to a person's health as they age. This topic is discussed in "Balance: An Overlooked Aspect of Fitness?" Each of these parameters is reviewed in detail in the series "Measuring Fitness" (see Articles) so they will only be discussed briefly here. FITNESS STATS FOR THE "AVERAGE GUY"
The May 2004 issue of Men's Health magazine listed fitness stats for "the average guy" (sorry, no data were provided for women....). Although these measurements were obtained from males ages 18 - 24 years, at the very least, they give us some place to start. Keep in mind, that's just the "screening" test! VO2max is the laboratory assessment of aerobic fitness. However, it's a somewhat uncomfortable and inconvenient test. Heart rate is a very simple, yet very useful indicator of your level of cardiovascular fitness. Everyone should know how to take their own pulse. Athletes with a high level of aerobic fitness (eg., cross-country skiers, marathon runners, triathletes, cyclists, etc. ), often have a resting heart rate slower than 60 bpm. For example, in the 1970's, the great tennis player Bjorn Borg was reported to have a resting HR of 38. Back then, a HR this slow was considered an anomaly. Today, it is recognized that aerobically-fit athletes routinely demonstrate a very slow resting HR. The lowest value ever measured was in Tour de France cyclist Miguel Indurain: 28 beats per minute! A resting HR less than 60 bpm in an aerobically fit person is not harmful; it simply means the circulatory system is more efficient at delivering and using oxygen. Nevertheless, even elite athletes have limits to how slow their HR can be before medical issues arise. Resting Heart Rate Also Reflects Poor Cardiovascular Health! Medical students are taught that a heart rate of 60-90 beats per minute is "normal." However, curiously, no age-related population norms exist for resting HR. Just as a healthy and strong cardiovascular system allows the heart to beat at a more relaxed pace, the resting HR in a person with poor aerobic fitness beats at a faster rate. A resting HR of 75 or higher has been associated with an increased risk of sudden cardiac death (Jouven X, et al. 2005). As long as you don't feel lightheaded when you stand up, and/or are not taking beta-blockers, digoxin, diltiazem, or verapamil, a resting HR of 60-70 bpm is desirable. If you are performing aerobic exercise regularly and your pulse is less than 70, you can feel confident that your cardiovascular system is pretty healthy! So, learn to monitor your resting HR. True resting HR is taken just as you wake up in the morning, even before sitting up in bed. No alcohol should be consumed the night before. This topic is discussed in greater detail in: "Heart Rate, Exercise Intensity, and Training". How quickly your heart rate slows down after exercise ends is also regarded as an important indicator of health and aerobic fitness. A healthier cardiovascular system "recovers" more quickly. Recovery HR is taken 60 seconds after exercise ends and is compared to peak HR during exercise. This topic is also discussed in detail in the related story "Heart Rate, Exercise Intensity, and Training". Muscular fitness is determined by assessing both strength and endurance. The bench press is commonly used to assess muscular strength whereas exercises such as pull-ups and push-ups assess muscular endurance. Obviously, as we age, it becomes more difficult to attain the same physical limits as we did when we were in our twenties. So, it is important to consider age when developing fitness targets for the general population. The NFL uses a 225-lb bench-press test to assess strength. In 1999, Justin Ernest did 51 reps! But, this test is not realistic for the average weekend warrior. There are 2 ways to assess muscular strength: (a) the one-repetition maximum (1-RM) and (b) estimation using sub-maximal weight. So, if you can bench-press 120 lbs. 5 times (with good form! ), then, your 1-RM would be: [120 lbs] x [1.15] = 138 lbs. In the elderly, a sit-to-stand test is used: This test counts how many times a person can stand up from a seated position in a specified amount of time. The most common test for determining flexibility is called the sit-and-reach test. To perform this test, the person attempts to touch their toes while seated on the floor, with legs straight out in front, toes pointing up. A measurement is made by determining how far their fingertips reach on a scale. This measurement is compared to a table of population norms. These age-group norms can also be found in the ACSM Fitness Book (see below). In an otherwise healthy person, resting (ie., while sitting) BP should be no higher than 120/80. A systolic BP of 120-129 is considered "elevated." When systolic BP reaches 130, or diastolic BP increases above 80, a person is said to have "hypertension" (Whelton PK, et al. 2018). Many people know their cholesterol level. This number is likely to be their "total" cholesterol. By itself, the total cholesterol value is not very useful. It's more important to know the "LDL-cholesterol" value and the "HDL-cholesterol" value. LDL, the "bad" cholesterol, can be lowered by limiting saturated and trans fat and refined carbohydrates in the diet. HDL, or "good" cholesterol, can be increased by regular aerobic exercise. During the past 2 decades, the blood test "high-sensitivity C-reactive protein" (hs-CRP) has become as important as LDL-cholesterol. In fact, I regard hs-CRP as even more useful (Ridker PM. 2003a). Whereas your LDL-cholesterol helps to assess the risk of medical events related to atherosclerosis, hs-CRP reflects not only atherosclerosis severity, but a lot more. When your hs-CRP is elevated, it means you are in a state of inflammation, even though you can't feel it. Many years of low-grade inflammation is now regarded as a substantial factor leading to not only coronary heart disease (Yeh ETH, et al. 2003), but, also, several forms of cancer and even dementia. Data from the Women's Health Study revealed that elevated blood levels of hs-CRP were a stronger predictor of cardiovascular events than elevated LDL-cholesterol levels (Ridker PM, et al. 2002). The Women's Health Study also revealed that a hs-CRP value above or below 3.0 mg/L was as useful at predicting future cardiovascular risk as was the accumulation of traditional criteria for metabolic syndrome (Ridker PM, et al. 2003b). A separate study found that hs-CRP correlated with the degree of carotid stenosis but LDL-cholesterol did not (Mullenix PS, et al. 2007). After an overnight fast, if the blood glucose level is 100-125 mg/dL, this is considered "impaired." Forget the bathroom scale. The following measurements will give you a much better idea of your overall health. Body mass index compares weight to height. A high BMI value has been shown to predict a higher risk of death from cardiovascular disease, especially in men (Calle EE, et al. 1999). But, while BMI is an important measurement in obese and deconditioned people, it is not very useful in the heavily-muscled body-builder. This is because the value does not discriminate between fat weight and muscle weight. Use our BMI Calculator and Tables to determine your own specific value. NOTE: The BMI limits listed above do NOT apply to children. This is simply the circumference of the waist divided by the circumference of the hips. Recently, the waist-to-hip ratio has been found to be an important predictor of health problems and the medical community has gradually shifted away from the BMI value in favor of the waist-to-hip ratio as a better indicator of health problems related to overweight and obesity. Obesity is linked to hypertension, diabetes, heart disease and many other medical conditions. Losing weight helps to get them under control. You can keep every one of these fitness and health parameters in the "healthy" range with a combination of diet modification and regular exercise. If you are seeking optimum "fitness," then you would need to perform all 4 of these types of exercise each week. However, if you are sedentary and just want to start improving your "health," keep in mind that a reduction in the risk for cardiovascular disease begins with as little as 500 kcal of exercise per week. Going for a 30-minute walk around your neighborhood every day might be all it takes to prevent a heart attack or stroke! • Consult your physician: If you (a) have any medical conditions (in particular, heart disease, hypertension, diabetes mellitus, asthma, back pain, osteoporosis), (b) have not exercised in a long time, or (c) are more than 40 years old, you need to discuss your exercise plan with your physician. • Consider hiring a personal trainer: A properly educated and certified personal trainer can be very helpful if you have not exercised regularly. Make sure the trainer you hire understands and recommends aerobic exercise as well as strength training. See: "How To Choose a Personal Trainer" for more information. 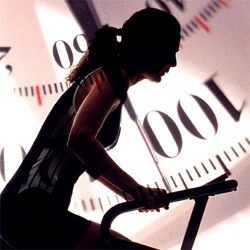 • Monitor your progress: Learn how to monitor your heart rate during each exercise session. Stop exercising if your heart rate gets too high, or, if you feel faint or have sensations in your chest. Also monitor your progress, but don't set unrealistic goals and don't try to progress too fast (this is where a personal trainer can be helpful). 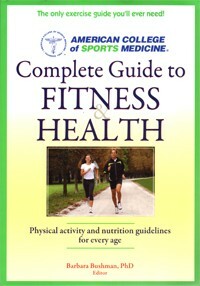 An excellent book for people who want to get serious about their fitness is ACSM Fitness Book. Although this book was published in 2003, and, an extensively-updated version was published in 2011, we still like the 2003 edition because it is shorter, succinct, and easy-to-read. Both editions of this book contain many tables and charts that help the reader determine their level of fitness and track their progress. Dozens of color photographs demonstrating the proper position for various stretches and exercises are also provided. For those who are interested in the most recent ACSM exercise and fitness book, go to: Complete Guide to Fitness & Health. Both books are reviewed in our Book Reviews section. Many of the health targets listed above can be found at the web site for the National Cholesterol Education Program. For those who are interested in track & field, performance standards for masters athletes can be found at: National Masters News.